M Roofing, LLC has been in the roofing business for more than 19 years. Our experienced roofers are certified for all aspects of residential roofing, including roof installation, roof repair, and roof replacement. For roof repairs that are covered by insurance, our administrative staff will assist with the claims process to expedite your insurance claim. When you have roof damage, call M Roofing, LLC, your local roof repair professionals: (832) 856-3853. Roof damage can be caused by strong winds, ice dams, heavy snow, falling branches, house fires, and even animals. Whatever the cause, the damaged portion of your roof must be replaced quickly by a reputable roofing professional. Otherwise, your roof and your home are at risk for even more extensive damage. M Roofing, LLC has provided precision roof repair with quality products and exceptional workmanship since 2000. If your roof is damaged, call (832) 856-3853 for a comprehensive, no-cost roofing estimate. Whether your roof is constructed from asphalt, tile, metal, copper, tile, or cedar shake, the expert roofers at M Roofing, LLC will repair the damaged portion of your roof with a quality roofing product that blends in with your existing roof. 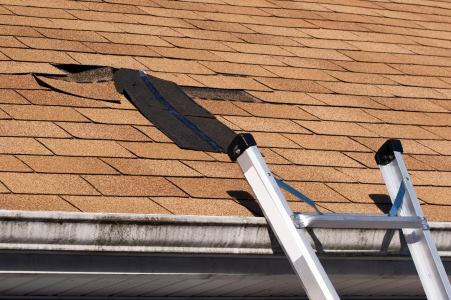 First, our roofing crew will carefully remove all damaged shingles or tiles. Once the roof sheathing is exposed, our roofers will check for water damage and structural damage. If necessary, the area will be re-framed to meet local and state building codes. Our roofers will then replace any damaged or cracked shingles and tiles. Curled shingles can be re-glued to the sheathing. All work is done with precision to ensure the patched area matches the style and design of your existing roofing. If your roof has been damaged, call the roof repair experts at M Roofing, LLC: (832) 856-3853.